If you are one of the followers that has enjoyed my series on branches in home decor then I recommend you visit my Pinterest board on branches and trees. It is here I have continued to collect images of branches and trees. This is a growing scrapbook of inspirations and, even though the blog series is done, I continue to add to it. 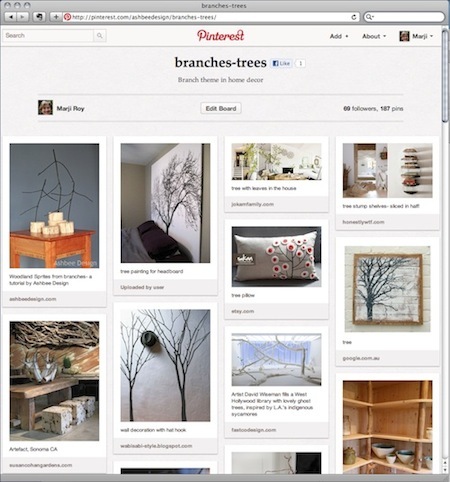 If you love the idea of bringing the outdoors in, then follow this board of mine on Pinterest. Simply put, Pinterest is a bookmarking site for images with a sharing aspect built in. It does require registration and an invitation (which means a delay) but it is a wonderful way to collect images. I could never get excited about Twitter because every tweet was a link- and my Internet connection is so slow that each click just slows me down. Pinterest does a better job of showing me the images, and when ones interests are in the design world, it is the images one needs to see. If you want to follow all my Pinterest boards, click on the link in the left navigation bar. Warning- pinning can be addicting!